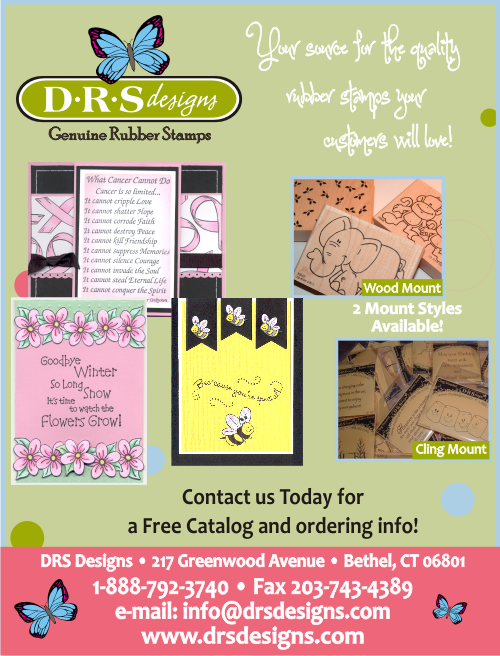 DRS Designs would be pleased to count your stamp or art store among the growing number of retailers offering DRS Designs Rubber Stamps to their clientele. For information, you may write, email, fax or call us and we will send you our wholesale information along with a copy of our current catalog. Your first order must be accompanied by a copy of your state resale certificate and full payment before it is shipped. We accept MasterCard, Visa or Discover. Net 30 terms are available on subsequent orders with approved references. Please ask for details. Most orders are fulfilled within 5 days of receipt and are shipped from Bethel, Connecticut via UPS or USPS Priority Mail. DRS Designs provides free hand stamped samples (like those on this site) with every wholesale order! Web Site Blog - Click Here!